You can ignore the slow-moving tourists, get over the crowded streets and humid subway, and deal with beggars and never-ending construction. But, what’s one of the most difficult things about living in the city…one of the biggest pests of all? The cost of living! New York is known as the “city that never sleeps.” So, what is everyone doing if they’re not sleeping? Exploring the nightlife! Whether watching a movie at the theater, dining out, sipping cocktails at a bar or checking out the city’s hottest nightclub, one thing is certain…enjoying NYC at night is expensive! 1. Movie ticket: some theatres charge almost $20 per ticket! 2. Dinner for two: anywhere from $30-$300 and up! 3. Drink price: $11-$25 and up! 4. Cover charge: as much as $15-$20 *Note: The cover charge at one of NYC’s Top 25 Bars and Clubs could be even higher! While ballin’ on a budget in NYC may seem impossible, there are nightclubs and parties in each of the five boroughs that do not charge a cover. Here is a list of six websites that can help you find something to do this weekend without breaking your budget! 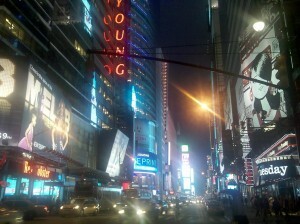 This entry was posted in Lists and tagged Free, New York City, Nightlife, pests. Bookmark the permalink.